Skin pineapple and scrape out the flesh. Drain flesh on a sieve for 10 minutes to obtain ½ cup of juice. Place the scraped pineapple flesh in a non-stick pan and add granulated sugar, pineapple juice, lemon juice, cloves and cinnamon. Place pan over low heat and cook, stirring occasionally for about ½ hour until pineapple jam is sticky and can easily be rolled into a ball. Set aside to cool. 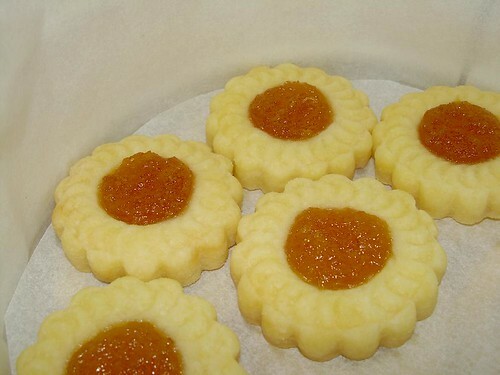 OMG, they look toooooooo good I looooooove Pineapple tarts. Now this is my next baking project I swear. But I don’t have the mould, how? Rasa Malaysia : You can use any suitable mould, which I am sure you can get from California. Mei : Thanks for the suggestion Mei. I loovvee your Jam tarts! I think that’s my all time favorite. But I cannot get this molding for the tarts. Where do you buy it in Malaysia? My sister is going home this summer and maybe she can get it for me. Tell me where to get it? The moldings in California or the US all has other shapes like disney characters, hearts and so on. But your molding would be the right kind for this traditional tart. Pllleeeaaase do tell. Kampung USA : Oh dear! I missed your comment here in the midst of the others. Well, you can get this type of mould in most supermarkets in Malaysia, at the baking section. It’s quite common here actually. If you still have trouble finding one, email to me. My email is found at the About page. Pineapple Tars are yummy. Who cares even though it will add to my weight, ha! Ha! I love it and will try this receipe . I’ll try all pineapple tarts recipe if its good. Why do u need to add lemon juice for the pineapple jam? I’m so curious to know about it. Mary : I believe the lemon juice makes the jam easier to handle. Otherwise, it may be watery and thus difficult to put onto the pastry. I am just learning how to make the jam. I find that my jam tends to turn very dark after cooking it. Any idea why? what you mean by 1b of flour ? and some cold water is about how much ? someone please answer me as soon as possible . I’ve no time to prepare my own pineapple jam for the tarts, so I usually buy from either confectionary shops or mini-mart in Singapore. However, these jam tends to be too sweet and lack the sourish taste which is preferred by most of my friends. Just wonder if the lemon juice can help to “neutralize” the sweetness a little to suit our taste buds? If not, what can I do to reduce the sweetness or increase the sour taste? Thanks! Kelly, how abt trying this receipe without water. 600gm plain flour, 375gm butter, 1 egg, 1 teaspoon of vanilla essence. I always use this hasslefree dough for the “closed” pineapple tarts. No castor sugar or water needed. I’m wondering if vanilla essence could be substituted with pineapple essence. Anyone out there has tried this subsitute? Hi, thanks for this recipe! It is so easy to do and delicious especially the pineapple jams which everyone tasted compliments of its freshness! I cut the sugar down to 150 gm and the sweetness just right! I love pineapple tarts, but have never bake in my life till today. I want to try making them according to your recipe. Please tell me the size or weight of the pineapples and the type. For the pastry is it plain flour or self-raising flour? Skin pineapple and scrape out the flesh. Drain flesh on a sieve for 10 minutes to obtain Â½ cup of juice. What is obtain Â½ cup of juice. so how many cups? How big is your cup?ml? I tried this recipe out and made the jam a little thicker than what it looks like in the pic. Turns out i can roll the jam into the pastry and make little balls of pineapple filled tarts! and they actually tasted better than the flower motif ones that i also made, becoz the jam stays soft wrapped inside the pastry. Do u bake the jam with the pastry? Cerry : Yes, bake both. Kate : I’m afraid it won’t. And you’ll need dozens of cans to cook them before they reduce into sticky jam. 1) The protein in the pineapple denatures due to the cooking process. Like how raw egg whites turns from colorless to white is due to the denaturation of it’s protein. 2) The sugar is probably caramelizing, which is also a really natural process. I have made this jam, and I feel that 250g of sugar makes it super sweet; this is probably because the pineapple I’ve bought is pretty sweet itself. The sugar amount should be altered depending on the natural sweetness of the fruit! Elaine : Use the clove in its whole form and remove it once the jam is cooked. It’s purpose is just to flavour the jam. Hi. I brought ready-made pineapple jam to make the tarts. The pastry turned out ok, but the jam was so hard after baking. Even when I tried to stick a fork in, it couldn’t go in. What’s wrong with the pineapple jam? I even mixed some water into the jam, but it was still hard after baking. What should I look for when buying pineapple jam? Asley : My guess is that the pineapple jam was too hard to begin with. After baking, the jam tends to dry up and harden a little. So, try to get one which is slightly softer than the one you bought.